The pope’s speech took place in the presence of students, recently unemployed workers, and struggling farmers, at a school located in a region of Italy known for its strong agricultural and industrial ties. Francis, who hails from Buenos Aires, holds a particular affinity for the environmentalist movement due to the wide scale deforestation of rainforests in his native South America. 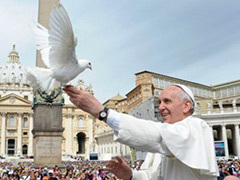 In his speech, he referred to the destroyed forests in South America as his homeland, and as land that “can no longer give life.” He also takes his name from Saint Francis of Assisi, know as the patron saint of not only the environment, but animals as well. This wasn’t the first time Francis has addressed climate change, as he has tackled the subject on multiple occasions, including at his inaugural mass, as well as at a summit on sustainability this past May, where he was quoted as saying “If we destroy Creation, Creation will destroy us.” In fact, Francis is said to be working on an encyclical about the relationship between people and nature.